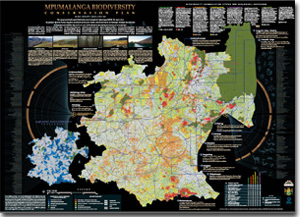 The success of the biodiversity planning project will be measured by how effectively the products are used and therefore time and energy needs to be dedicated to incorporating the products into the policies, decisions and actions of a wide-range of other sectors. Products have often been successfully incorporated where stakeholders have been involved from the beginning of the process and help guide the production of the products to meet the needs of the end-users. 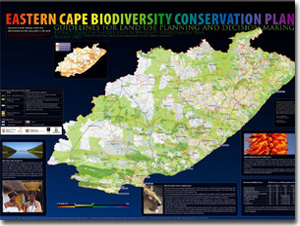 Posters produced for the Mpumalanga Biodiversity Conservation Plan (left) and the Eastern Cape Biodiversity Conservation Plan (right). Provincial environmental departments and conservation agencies, to streamline environmental decision-making using the best available information and to identify and prioritize protected area expansion. Municipalities, to strengthen forward planning (e.g. SDFs) and improve day-to-day decision-making that impacts on natural resources. Department of Agriculture, to inform agricultural authorizations such as ploughing and subdivision applications. Department of Minerals & Energy, to inform decisions about prospecting and mining licences. 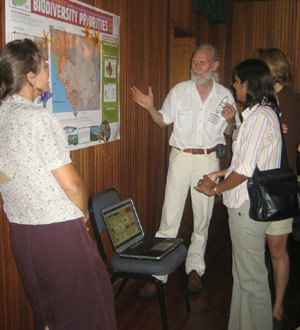 Developers, to inform project planning so that conflicts between development and biodiversity can be avoided. EIA consultants, to inform environmental assessments. Planning consultants, to incorporate critical biodiversity areas into SDFs and other sector plans. Working for Water and Working for Wetlands, to help prioritise alien clearing and wetland rehabilitation. Catchment Management Agencies, to inform allocation of scarce water resources and management of land in priority catchments.